When the newly-elected Board of Directors and Officers assumed the leadership of the IBP Makati Chapter in 2013, Chapter President Atty. Bienvenido I. Somera, Jr. resolved to be guided simply by three simple virtues: benevolence, integrity, and service. These virtues encapsulate his passion and desire to simply do what needs to be done. (6) Promotion of fellowship and camaraderie among members. Developments of the new decade have ushered in an unprecedented era of accessibility and interconnectivity. Recognizing the potential of emerging avenues of social and online media waiting to be tapped, the Chapter’s leadership wasted no time exploring new frontiers by taking advantage of online services to serve as the platform for its legal services and advocacies. The Chapter started its flurry of digital innovations with the relaunching of the IBP Makati’s official website, http://www.ibpmakati.com/ Serviced by a new web host, the Chapter’s upgraded official website now functions as a repository of relevant and timely information on the projects and activities of the officers and members of the IBP Makati. The Chapter’s official website also contains a directory of all its members. To provide an additional tool for the continuing education of the legal community, the Chapter launched its Legal Education Updates blog which features digests of novel Supreme Court decisions, rulings of administrative agencies and other newly promulgated laws, orders, and circulars, as well as legal material of interest to the public. In August 2013, the Chapter formally launched its Facebook page which serves as an online forum for its members and showcases the various projects and advocacies of the Chapter. Updates to the Facebook page were continuously maintained to ensure an online presence that will encourage members to participate in the Chapter’s projects and advocacies while, at the same time, bringing the Chapter closer to its members wherever the legal profession may take them. Looking to the past, The Chapter’s official newsletter was renamed the Cirillon, as a tribute to its founder, Atty. Cirilo Doronila, who also served as the Third President of The Chapter. 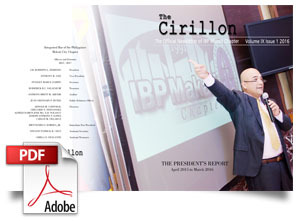 Under its new masthead, the Cirillon seeks to move the Chapter forward by serving as its clarion call, exhorting its members to further participate in IBP Makati activities. The Cirillon now enjoys an unprecedented distributorship by making copies of the newsletter available for download in the Chapter’s official website and Facebook page. 2013 ushered in a season of immense political upheavals after whistleblowers exposed the Priority Development Assistance Fund scam which will go down in Philippine history as one of the grandest conspiracies of plunder of the Nation’s coffers in the highest levels of Government. The Chapter wasted no time and joined the People in the indignation against the massive betrayal of public trust. Leading the legal profession, the Chapter publicly decried the gravest of betrayals of those who purport to call themselves public servants. The Chapter went on the warpath by offering its assistance to the Ombudsman for the swift prosecution of all individuals involved in the PDAF scam, whether in the private or public sector. As part of the public’s clamor for genuine reform, the Chapter also took to the streets during the Million People March on 04 October 2013 to express their utter disgust against the deep-seated corruption involving political leaders in conspiracy with private citizens. The Chapter’s unequivocal message was that it will not take this betrayal sitting down and will exhaust all avenues to ensure justice is brought to bear. A year since the exposé, the Chapter maintained its steadfast commitment to restoring accountability and integrity in the Government during the Stand Up, Sign Up Against Pork mass action at the Quirino Grandstand on 25 August 2014. The Chapter, led by its President, Atty. Bienvenido I. Somera, Jr., renewed its persistent clamor for massive reform and the outright condemnation of any form of pork barrel, Charter Change, and threats to judicial independence. In the years since, the Chapter has clearly made its mark on contemporary political events by making its position on issues of national interest loud and clear. Among the fundamental goals of the IBP is to assist our legal institutions in the administration of justice. For this purpose, the Chapter has been active in movements to reform long-standing laws and rules of procedure which have been the subject of various studies for reform. On 27 August 2014, the Chapter submitted its comprehensive Comments on the Draft Revised Rules of Civil Procedure. With fearless fervor, the Chapter voiced its apprehension against potential pitfalls created by simplistic amendments and sweeping generalizations. The Chapter’s reasoned dissent provides a practitioner’s perspective against untested procedures driven by well-meaning yet misguided zeal to attain the “dictates of justice”. In October 2014, the Chapter participated in a consultation and dialogue regarding the resolution of issues on the implementation of Republic Act No. 8552, otherwise known as the Domestic Adoption Act. Despite voicing vehement opposition against certain amendments in the Proposed Rules on Civil Procedure, the Chapter committed its assistance to the piloting of the Proposed Rules on Civil Procedure in selected Makati City and Quezon City trial courts on 12 December 2014. The piloting project of the Supreme Court was organized under the guidance of Justice Roberto Abad and The Asia Foundation and is set to commence in February 2015. Even in dissent, the Chapter still rallied more than fifty volunteer lawyers from the country’s leading law firms for the Pre-Piloting Seminar Workshop conducted by the Supreme Court and The Asia Foundation for the training of Makati City trial court judges prior to the piloting of the proposed rules in selected Makati City trial courts. The workshop was held on January 28 and 29, 2015 at the Metroclub, Makati City. On 06 December 2013, the Chapter held a dialogue with the Makati court judges and the Public Attorney’s Office which resulted in the signing of a Memorandum of Agreement allowing the provision of transcript of stenographic notes for free to indigent litigants represented by legal aid lawyers. Without letting up on its provision of free legal aid to indigent clients, the Chapter also took the opportunity to review its criteria for acceptance of legal aid cases in order to provide focused legal aid to those indigent clients who need it the most. The Chapter is now gearing to limit legal aid cases to more pressing controversies, particularly those which involve the imminent deprivation of the liberty and property of indigent litigants. In order to be able to accommodate more cases of this nature, it was proposed that controversies which involve purely commercial or corporate matters be excluded from the new legal aid cases to be accepted by the Chapter. Carl Jung once said that “you are what you do, not what you say you’ll do.” The Chapter has always known the wisdom of speaking by example and not words. Thus, the Chapter’s best achievements are those founded on action and not simply lip service. Throughout his term, Chapter President Atty. Bienvenido I. Somera, Jr. led the IBP Makati in various advocacy thrusts which included the protection of the environment, restoration of livelihood for calamity victims, promotion of rights of women, overseas Filipino workers, and accountability and integrity in government. The Chapter, in partnership with the Eco Divers Association, spearheaded the 2014 edition of the “Lex Aqua Underwater Coastal Clean-up Drive” held on 13 December 2014 at Balayan Bay, in Brgy. Anilao, Mabini, Batangas. With the full support of the Local Government of Mabini, Batangas, IBP Makati lawyers led the collection and proper disposal of garbage strewn along the coast and seabed of Balayan Bay. This environmental project sponsored by the IBP Makati was first organized by the Chapter’s Developmental Legal Aid Committee in October 2013 and has resulted in the collection of at least 110 kilograms of coastal garbage in 2013 alone. The Chapter also co-sponsored the Office of the Ombudsman’s Forum on Anti-Corruption Drive held at the Ateneo de Manila School of Law. The Chapter reiterated its commitment to provide any form of legal assistance to the Ombudsman for the prosecution of culprits in relation to the PDAF scam. In December 2013, the Chapter participated in a legal consultancy program for overseas Filipino workers organized at the request of the Philippine Overseas Employment Authority. Chapter members assisted overseas workers with concerns regarding administrative requirements and benefits. The destruction brought by Super Typhoon Yolanda served as a wake-up call for the rest of world on the dangers of climate change. For the more fortunate ones, the vast devastation suffered by our countrymen in Samar and Leyte awakened the spirit of overwhelming charity, especially with disaster striking so close to the Yuletide Season. Rife with the spirit of philanthropy, the Chapter’s leadership wasted no time in mobilizing the Chapter as the springboard for relief efforts for Typhoon Yolanda victims. Chapter members responded to the call for assistance to Yolanda victims with an outpour of Christmas packages, including slippers, shoes, bed sheets, water, and canned goods. Donated items were turned over to “Love for Guian” an organization assisting in the relief efforts in Guian, Eastern Samar, Palo, Leyte and Ajuy and Estancia, Iloilo. On 15 February 2014, the Chapter, led by its President Atty. Bienvenido I. Somera, Jr., participated in a legal aid mission in Tacloban City conducted by the NGO Integrated Development Empowerment and Advocacy for Livelihood Support (“IDEALS”). Entitled “Access to Benefits and Claims after Disaster,” volunteer lawyers manned legal aid stations where Tacloban City residents may seek legal advice on securing assistance from government agencies. Lawyers also assisted in the preparation of legal documents such as affidavits of loss, identity, and ownership which may be used to regain access to basic governmental services such as SSS, GSIS, Pag-Ibig, and Philhealth. Golf is a passion most lawyers share. In an interesting twist of pleasure and charity, the Chapter organized a charity golf tournament entitled “Golf-to-give” which showcased golf skills of the country’s top legal minds for the benefit of the victims of Super Typhoon Yolanda. The event was a rousing success which raised over PhP400,000.00 for the funding of the Chapter’s legal aid initiatives in Leyte. Proceeds of the tournament were turned over to IDEALS for the reconstitution of vital legal documents of Yolanda victims which were destroyed during the onslaught of the super typhoon. On 11 July 2014, the Chapter saw the implementation of "The Peter Project" which provided fishing boats to restore the livelihood of fishermen who lost everything in the destructive wake of Super Typhoon Yolanda. In partnership with the Negrense Volunteers for Change Foundation, Inc. and the Aklat, Gabay, Aruga Tungo sa Pag-angat at Pag-asa Foundation, Inc., the Chapter recently turned over four (4) fiberglass boats to the immense gratitude of the fisherfolk of Tanauan, Leyte. The Chapter also lent its steadfast support by representing the IBP National Office in the “Walk to End VAW” which was held in celebration of the International Day for Elimination of Violence Against Women on 25 November 2014. Lawyers from the Chapter volunteered and manned the IBP National Office’s Public Service & Crisis Center which provided legal advice to concerned parties relating to the protection and enforcement of women’s rights. Beneficiaries of the Chapter’s charitable initiatives were not limited to typhoon victims only. Recognizing the importance of education in nurturing the younger generation, the Chapter, on 21 December 2014, donated books to the children of Barangay Kay-Anlog Resettlement Site in Calamba, Laguna. The books serve as the Chapter’s contribution in the community’s efforts to restore their library with a wider and meaningful selection of reading materials. The lifeblood of any organization is the men and women that comprise it. For Chapter President Atty. Bienvenido I. Somera, Jr., one of the IBP Makati’s duties is to provide “an atmosphere of camaraderie and fellowship that will strengthen the bonds between members, allowing them to work more cohesively in pursuit of the goals and missions of the Chapter”. Yet, in an increasingly hectic and grueling professional world, it cannot be denied that time has become the most scarce and valuable resource for lawyers. That being said, the Chapter never gives up in coming with creative ways of encouraging its members to nurture the brand of camaraderie that distinguishes the IBP Makati Chapter from the rest. On 30 August 2013, the Chapter inducted its new members in an event entitled “Iunctus”, held at the Rainmakers’ Lounge at the V&A Law Center in Bonifacio Global City. In addition to the opportunity for Chapter members to mingle, the event was graced by the attendance of Sandiganbayan Justice Napoleon Inoturan, Intellectual Property Office Director-General Ricardo Blancaflor, and Judge Rommel Baybay of the Regional Trial Court of Makati City, Branch 132. On 18 June 2014, the Chapter inducted more than thirty (30) new members, mostly young lawyers fresh from passing the 2013 Bar Examinations. The Induction Ceremony was held at Bravo Restaurant on 18 June 2014. In addition to the Chapter’s leadership, the Induction Ceremony was graced by the attendance of IBP National President Vicente M. Joyas and IBP Governor for Southern Luzon, Ramon S. Esguerra. With the newly inducted members, the Chapter is proud to report that it remains strong with over Three Thousand (3,000) members in good standing. During the IBP Southern Luzon Regional Convention last 24 to 26 July 2014, Chapter members actively engaged in friendly competition with other IBP chapters during the IBP Southern Luzon Regional Sportsfest. On 05 December 2014, the Chapter held its annual Christmas Party along J.P. Rizal Avenue, Makati City. Judge Selma Palacio Alaras of the Makati City Regional Trial Court graced the event and expressed her support for the Chapter’s proposed Jail Decongestion Program. The IBP Makati Chapter has always been known for its projects and activities which were only made possible through the support and conviction of its members. It is this consistent desire to contribute what little time they may have for the betterment of Philippine society which allows exemplary Filipino lawyers to overcome the numerous temporal and logistical obstacles that they regularly face not only in practice, but also in their everyday lives. It has been our pleasure to have served the Chapter as members of its Board of Directors and Officers for the years 2013 to 2015; for these years have, indeed, proven that service rendered in a spirit of joy brings satisfaction without equal. We look forward to moving forward as the Chapter readies itself to face head-on the challenges and opportunities brought by the promising future.